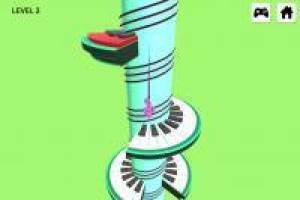 Helix Jump is a game that has dazzled millions of users through its mobile game and now comes in a new version in which their platforms have become pianos. In addition, the ball has been replaced by a treble clef and we will have to guide it to the end of this great tower. You will have to use the touch screen of your mobile phone or tablet, or the mouse of the PC, to move the tower and drop the treble clef to the vacuum to get to the bottom of the whole. You will have to be very careful with the red platforms because if you fall in one of them you will have lost the game and you will have to restart the level. 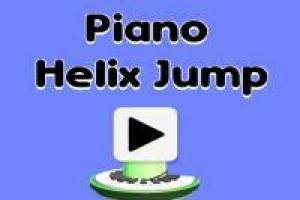 Get the treble clef in this new version of Helix Jump set on a piano. 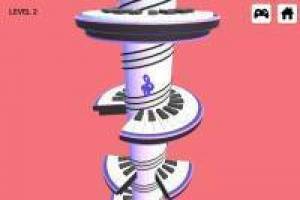 Enjoy the game Piano Helix Jump, it's free, it's one of our Piano games we've selected.